SHINY & GOLDEN Not everything that glitters is gold. This time the saying is not true. Our three beloved camera models Diana F+, Diana Mini and Fisheye 2 have gone through a shiny make-over by Mister Goldfinger himself. Dangling from a bling bling gold chain, they are ready to shine. Still enthusing with unique virtues, they now cause a stir with their glamorous new look. 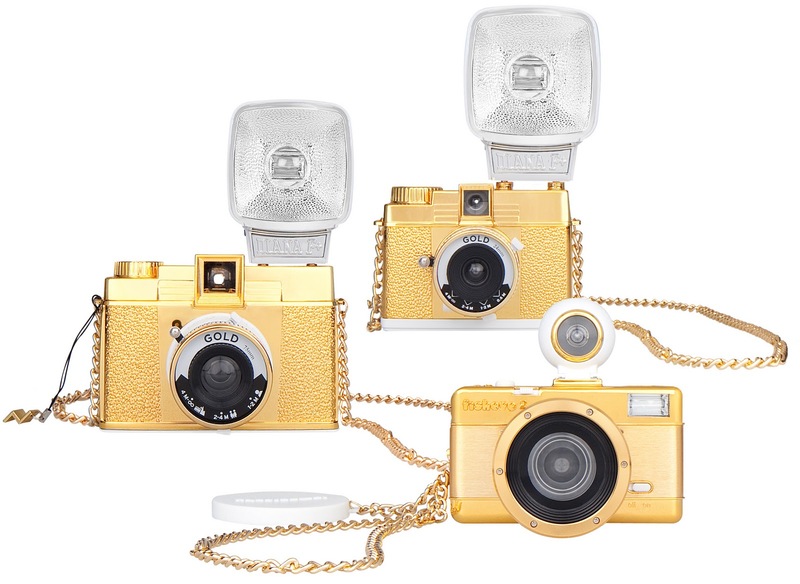 Dangling on a golden chain in your hand, the cameras of the Gold Edition are the must-have accessory for hip parties and special occasions. SIZE DOES NOT MATTER But as life shows, outward appearance is not the only important thing in life. Moreover the Gold Edition convinces with its outstanding intrinsic values of producing extraordinary photos. Wearing the same golden and white dress, the tiny Diana Mini doesn’t need to be afraid of a comparison with her bigger sister: While the Diana F+ convinces with its dreamy, radiant and lo-fi images, the Youngster with the half-frame format knows how to fascinate in her own charming way. A TWINKLING STAR IS BORN The golden dress is finally the suitable look for this star. The Fisheye 2 is already well-known and loved for its unique perspectives through the built-in fisheye lens. Especially these two factors make the Gold Edition a real treasure: Colorful and remarkable in their perspectives, these cameras capture your precious memories in stunning and unique pictures while blinging away in goldenness. The Lomographic Society International is a globally-active organization dedicated to experimental and creative snapshot photography. Boasting over a half-million members across the world, the concept of Lomography encompasses an interactive, vivid, blurred and crazy way of life. Through our constantly expanding selection of innovative cameras & photographic accessories, we promote analogue photography as a creative approach tocommunicate, absorb, and capture the world. Through the efforts and skill of our Lomographic Society members, we seek to document the incredible planet around us in a never-ending stream of snapshots – literally a global “Lomographic” portrait as seen through the eyes of countless individuals and cultures.